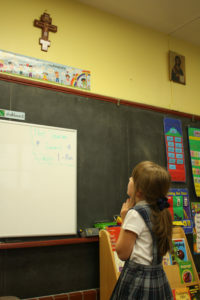 The mission of St. Nicholas Cathedral School is to provide a unique learning environment where academic excellence and traditional values are affirmed and imparted. The school fosters a strong foundation of knowledge that encourages curiosity, inspires success, nurtures self-esteem, and builds character and discipline. We help students develop Catholic values, a respect for the individual cultural heritage, and community pride. We recognize that parents are the primary educators for their children, and we work to complement the values taught at home. Our students, faculty and staff pride themselves on making St. Nicholas a home for excellence and achievement fostered by the appreciation of God’s presence in each individual. At the heart of our mission is our desire to bring all children to a deeper knowledge of love, forgiveness, compassion and justice. We endeavor to teach our students to appreciate each individual’s uniqueness, respect cultural values, and develop an awareness and reverence for global diversity and the earth we share. All children, Catholic and those of other faiths, will receive religious instruction appropriate to their grade level throughout the year. 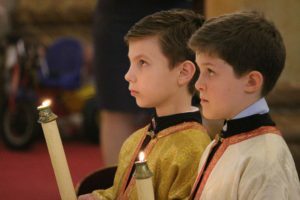 Although sacramental preparation is given through classroom work, students always have the option to receive sacraments at their own home parish.